The QTEs could actually work very well in its favor, as it delivers a cinematic edge that Ninja Blade delivered. It could make for an engaging experience to watch and play. 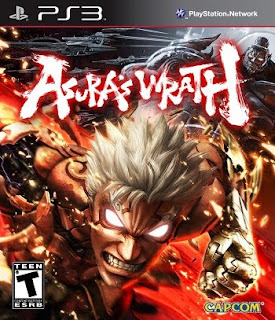 The gameplay seems simple enough to draw you in, and I am hoping that it expands on this as Asura transforms into several different forms. Hopefully. It doesn't seem to have much in the way of gameplay. Seriously, if I want a movie, I'll buy a movie, not a video game. Bloody crooks. When it does have gameplay... I just get the feeling that it'll be a little too simple to keep you engaged. I don't know. Between Soul Calibur 5 and Max Payne 3... well, it depends on how much time I'll be spending with the former, and that's if I don't buy Final Fantasy XIII-2 (which will be covered shortly in this blog). This seems like one of those "spur of the moment" types... if I have a lot of money on me, I'll spare a few dollars on it.